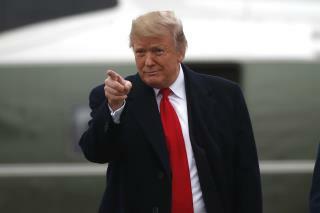 (Newser) – President Trump suggests that the flurry of late court filings Friday related to the Robert Mueller investigation "totally clears" him. But a man with familiarity in such things has a different view: "I think what this totality of today's filings show (is) that the House is going to have little choice, the way this is going, other than to start impeachment proceedings," former Nixon lawyer John Dean tells CNN. Dean, who served a short prison stint for his role in the Watergate scandal, was referring specifically to a sentencing memo in regard to Michael Cohen that links the president to felony violation of campaign finance rules. The memo says "Individual 1," believed to be Trump, directly instructed Cohen to coordinate illegal payments to two women alleging affairs with Trump. trump has done hundreds and hundreds of crimes worse than paying some keep-quiet money. Since 1984 he has been money laundering hundreds of millions for Russian Mafia and oligarchs. Of course a sitting President can be indicted. Nothing in the Constitution forbids that action. There has been reluctance to indict, in the past, but that is not and has not been based on any legal barrier. State or Federal charges can be brought against a sitting President. The only question is, who will have the spine and integrity to do it? That there is enough evidence to do so, with this President, is beyond doubt. The matter of a criminal charge, is entirely separate from the filing of articles of impeachment.